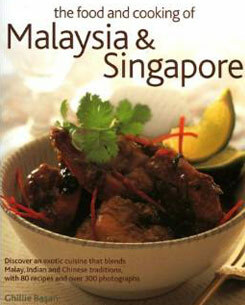 Discover the exotic flavours of a cuisine that blends Malay, Indian and Chinese traditions, with 75 fantastic recipes. An inspiring cookbook for the modern global kitchen, with fabulous and authentic recipes that include soups such as Laksa Lemak, satays, rice dishes, street snacks, seafood, meats such as Chicken Randang, sweet snacks and delicious desserts including Coconut Ice Cream. Includes more than 265 specially commissioned beautiful and evocative photographs. Complete nutritional information for every recipe. In this beautiful new book, Ghillie Basan explores the fascinating history, the rich culture and the social traditions of the Malaysian and Singaporean people, and the development of their cuisine. Over 75 classic recipes offer an authentic taste of South-east Asia for the Western kitchen. From spicy soups, mouthwatering appetizers, and meat dishes, to rice and noodle dishes and delicious refreshing desserts, the carefully researched and tested recipes promise delicious dishes that will be enjoyed again and again. With inspirational images of the region, of the ingredients and every recipe, this evocatively written and stunningly photographed book captures the real flavour of Malaysia and Singapore, and is an irresistible volume for anyone who loves to explore new cuisines and good food.